I know it’s been awhile since my last post but I thought now was the perfect time to update on here. I have recently begun a new household, currently consisting of just one sim, Mr. Knox McQueen. Knox is neat, cheerful, and confident. Currently he works at the hospital. Knox is single and ready to find love, he wants to get married to his dream girl and have a large loving household. First though, we have to find his dream girl. After going to a few parties at the Chalet Gardens and Von Haunt Estate, and a couple of single’s nights at The Shrieking Llama, Knox has met four beautiful ladies, however he just can’t decide who to pursue. She is a snob, mean, and neat. She is cheerful, a bro, and a music lover. She is a foodie, bookworm, and neat. She is an insider, outgoing, and romantic. Knox needs your help! Who do you think Knox should attempt to pursue a romantic relationship with? Cast your vote here! So I have my first shell home all ready for you to download on The Sims 4 Gallery here. It’s called Oasis Awakening, I built this home in Oasis Springs, it is a modern home, awaiting your creative touch to layout and furnish the inside. Let me know what you think of Oasis Awakening down in the comments below! Can’t wait to see you put your creative intuitions to work! I know it has been a while since I last posted, that has been due to my health, things are looking up in that regard, but still a lot to go. In the meantime, I have been getting more interested in building in The Sims 4, and had an idea that I’m hoping you might be interested in. I feel like I am not a strong furnisher, (or builder for that matter, but we gotta start somewhere right? lol) so I was hoping that maybe some of you out there in the Simiverse would be interested in furnishing some shell homes that I make. What I am planning is that I will build the home (excluding the room layouts) and landscaping, then will upload the home to the gallery, where you can then download, and finish the home however you’d like, you can use CC or whatever you feel like using to spruce it up. If you have a Youtube channel, and make a video of the furnishing, let me know I would love to see it! Hopefully I will hear from some of y’all and we can have some fun together! Thanks for reading and have a lovely day or night wherever you are! Unfortunately, I have been having a couple of problems with the family I wrote about that I was going to be starting with fresh, so I still haven’t begun their lives unfortunately. 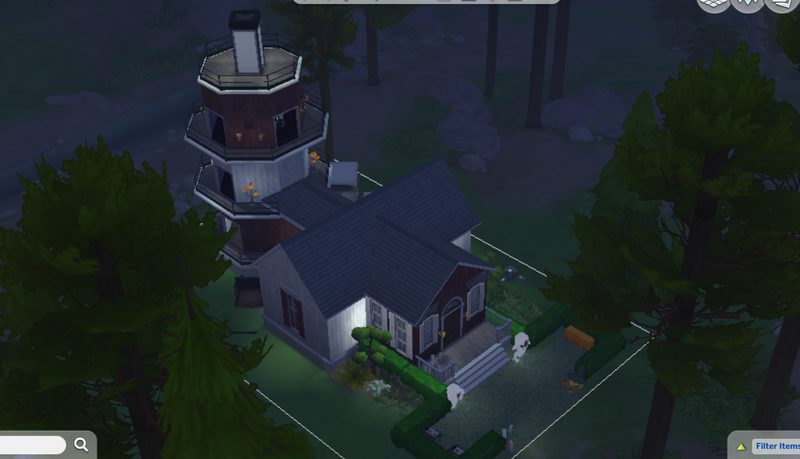 In the meantime, I decided to prepare for my FBHS event that I am hosting, by building a Haunted Lighthouse in Granite Falls. I am so pleased with how it turned out and I wanted to share it with y’all! I am getting ready to prepare a new game that I will be playing and posting about here. This is going to be focusing on a young couple who have met and fallen in love. They want to live a lifestyle of harvesting their own fruits and vegetables for cooking purposes as well as some flowers for profits as well. They both desire to have a large family. I thought it’d be really neat to have them name their children in a similar way, like using months of the year, or the same first letter, but to have the names be similar in some way. So I need help with naming the children, and I would love your input on how the names should be similar as well as what should we name their first child when they are ready to have children? Thanks for your help, and can’t wait for you to meet them soon! I am so excited to purchase this pack the instant it is released, it is going to be such a blessing to have for when I am hosting my Tricks or Treats? 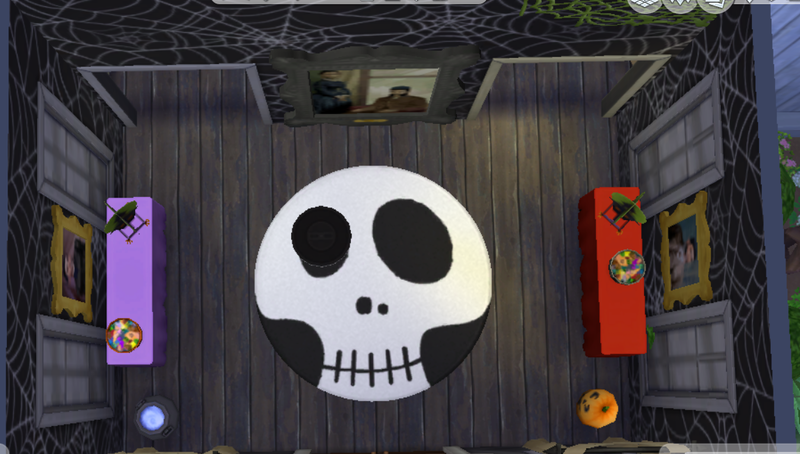 Halloween Party for the Freezer Bunny Holiday Simifest, which by the way, if you haven’t signed up for yet, you should get on the ball and get in on the fun, live vicariously through your Sims, by traveling to another Hard Drive to have some fun. There are so many great events to choose from. Hope to see you at one of the amazing events! Hey y’all, so I just wanted to let you guys know about something I am planning to participate in, called Freezrer Bunny Holiday Simifest. This has been started up by some amazing people such as Aroseinbloom, CathyTea, and sunny shay. What is happening, is a few simmers in the community are going to be hosting events for other simmer’s Simself to come and join in the event, we will be documenting and sharing the event when it is finished. FBHS is going to be so much fun, as it can bring together simmers in a new way, by allowing us to travel and meet other simmers, in their games too. I think this is going to be so much fun which is why you should go and sign up to attend an event, or even create an event to host for others to join. Halloween tends to bring out a feeling of adrenaline, from going to Haunted Houses, to Trick Or Treating you just get a special kind of rush. If your Sim wants that rush then “Tricks or Treats?”, is where they should be. We will be traveling to the ever mysterious Granite Falls, to stay in the Haunted Manor, we will be going hiking, to see if we can find the elusive Hermit of Granite Falls. We will also be having a delicious homemade dinner, telling stories around the campfire, and camping out the ol’ fashioned way, pitching up a tent or two. 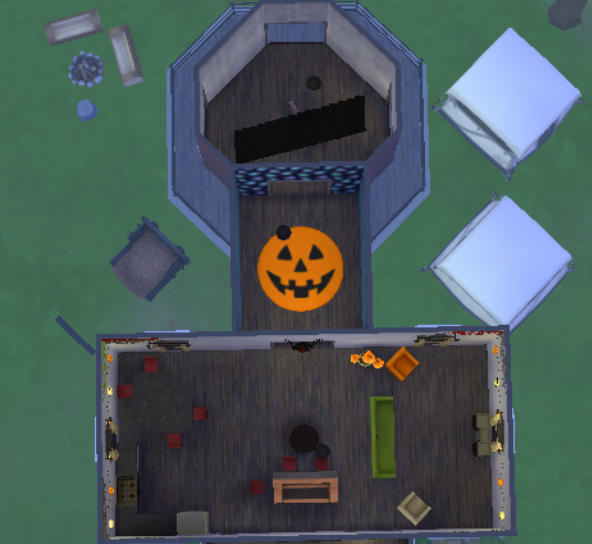 So will the Haunted Manor be full of Tricks or Treats for these daring Sims? **Any questions feel free to ask! Ugly Sweater Ice Cream Extravaganza! While unfortunately the Sims 4 has yet to produce any snow… 😦 We still have one way that we could be Ice Cold, with Ice Cream. So why not combine the chill of Ice Cream with the warmth of a sweater… That’s what the Ugly Sweater Ice Cream Extravaganza is all about, so I am inviting all of you over to my place, so let me know what your favorite ice cream flavors are so we can all enjoy some delicious treats! PS: Whether your sweater is ugly or not doesn’t make a difference, feel free to just wear a regular sweater or even a cute one! We’re just here for a good time! **Any questions feel free to ask! Eitherwhome, go on over to the Sims 4 forum which I have linked to above, and join in on the fun! They are going to do be doing events for different holidays! Have fun, sign up, meet new simmers, and HAPPY SIMMING!